John Deere has a well-established reputation for reliable and productive commercial lawn mowing equipment. Following customer feedback, the company has now launched the all-new X950R lawn tractor, whose rear discharge/rear collect system is the ideal solution when it comes to cut and collect performance. This is John Deere’s first commercial rear discharge/rear collect diesel lawn tractor, and the machine made its European show debut at IOG SALTEX 2013, Windsor in September. The X950R is aimed at professional groundsmen, landscape contractors, educational and recreational markets, and land management organisations. A 24.3hp diesel engine combines with the powerful hydrostatic drive and large capacity hydraulic rear wheel motors to provide a smooth ride. In addition, a hydraulic differential lock supplies the extra traction needed to tackle more challenging terrain. The shaft drive and heavy-duty gearbox also provide the power needed to drive the deck for long periods in tough conditions. The basic X950R will be available in four different configurations to suit different customer needs, with a choice of 122 or 137cm (48 or 54in) decks and either a low or high dump collector. Several features are designed to provide high-performance mowing and collection. The deep design of the high capacity steel decks allows a constant grass flow and easily copes with even very low or tall grass. The operator also needs to empty the hopper less often thanks to the high capacity 550-litre (low dump) or 670-litre (high dump) units. A unique single multi-function hydraulic lever makes the collector and deck operation extremely convenient, and also controls front mounted implements. A separate hydraulic pump is used to lift and empty the collector quickly at low engine rpm, and the collector can be opened in any position, which also saves time when discharging collected material. Additional features designed for operator comfort include repositioning of the steering wheel to enable easy access and a more relaxed arm position when driving, an optional adjustable high-back seat with premium cushioning and an optional arm rest kit. The X950R can also be customised to handle various conditions thanks to an easy to attach deflector shield. Equipped with a front hitch and front PTO to take a range of grounds care implements and other attachments for light winter maintenance operations, for example, the machine can be used all year round. 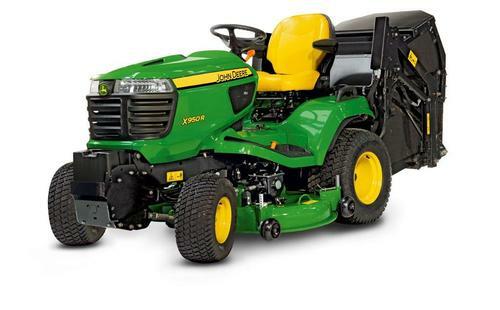 The X950R lawn tractor will be at John Deere dealerships from March 2014.